WEDNESDAY, Dec. 5, 2018 (HealthDay News) — Checking for low hemoglobin in the blood — otherwise known as anemia — usually means drawing blood for testing. But scientists say they’ve developed a wireless smartphone app that does the same by “reading” a quick photo of your fingernail. The app converts fingernail colors into quick readings of blood hemoglobin levels, according to researchers at Emory University in Atlanta. They said the technology could be used by anyone at any time, but its use right now is limited to screening, not a formal diagnosis of anemia. Anemia is a blood condition affecting 2 billion people worldwide. If untreated, it can lead to fatigue, paleness and heart problems. Typical methods of screening for anemia “require external equipment, and represent trade-offs between invasiveness, cost and accuracy,” lead researcher Dr. Wilbur Lam, associate professor of pediatrics, explained in an Emory news release. 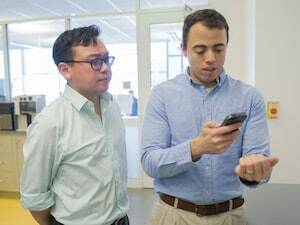 But the new app has an accuracy that’s “on par with currently available point-of-care tests, without the need to draw blood,” Lam said. The investigators believe the app could be useful for screening pregnant women, women with abnormal menstrual bleeding, or runners and other athletes. Its simplicity also means it could help people in developing countries. The app could be available for download as soon as spring 2019, the researchers said. One member of the development team, Rob Mannino, had a personal stake in the technology’s success. The former biomedical engineering graduate student has an inherited blood disorder called beta-thalassemia. “Treatment for my disease requires monthly blood transfusions,” Mannino explained in the news release. “My doctors would test my hemoglobin levels more if they could, but it’s a hassle for me to get to the hospital in between transfusions to receive this blood test. Instead, my doctors currently have to just estimate when I’m going to need a transfusion, based on my hemoglobin level trends.” In the new study, published Dec. 4 in Nature Communications, Lam’s team used data on 237 people — some anemic, some not — to develop an algorithm that converted fingernail color to represent blood hemoglobin levels. It was then tested on 100 patients and proved highly accurate in people with both dark and light skin tones, the research team said. That’s because the nail bed does not contain melanin, which gives skin its color. The app should enable patients with chronic anemia to monitor themselves to know when they need to adjust their therapies or receive transfusions. This could reduce side effects or complications of having transfusions too early or too late, Lam’s team said. Mannino’s experience proved integral to the research. “This whole project couldn’t have been done by anyone but Rob,” Lam said. “He took pictures of himself before and after transfusions as his hemoglobin levels were changing, which enabled him to constantly refine and tweak his technology on himself in a very efficient manner. So essentially, he was his own perfect initial test subject with each iteration of the app.” One doctor who often treats anemia in children was optimistic about the new technology, with one caveat. Dr. Michael Grosso directs pediatrics at Huntington Hospital in Huntington, N.Y. He agreed that “the availability of a rapid, accurate and non-invasive anemia screening test could have significant benefits.” But he was concerned that the app might miss more subtle forms of anemia. “It turns out that mild iron deficiency can affect the body without triggering anemia, and children in that situation would be missed by the non-invasive test,” Grosso said. “So, the smartphone test definitely falls short of the tried-and-true blood count, but it is better than no test at all.” For their part, Lam and colleagues said further research, conducted with a variety of patient types, is ongoing. That means the app’s sensitivity and accuracy should improve with time. “This is just a snapshot of the accuracy right now,” Lam said. “The algorithm gets smarter with every patient enrolled.” The research was funded in part by the U.S. National Science Foundation and the U.S. National Institutes of Health. Lam and Mannino have filed a patent application for the anemia app, and will have financial interest in its success. More information The U.S. National Heart, Lung, and Blood Institute has more on anemia.